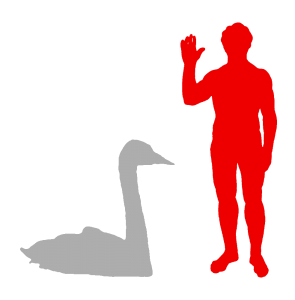 The Trumpeter Swan is the biggest living waterfowl species in the world. Therefore it is also the biggest swan in the world. It is said to be the biggest native North American bird. 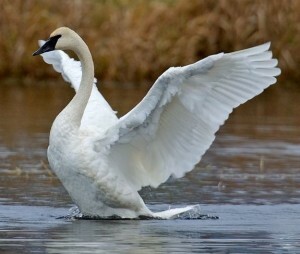 It is called a Trumpeter Swan because its honk sound like a trumpet. The males are about 145 to 163cm (57 to 64 inches) long and weigh about 12kg (26lb). The females are smaller. They are about 139 to 150 cm (55 to 59 inches) and weigh about 10kg (22lb). Their average wingspan is 2m (6.7ft). A very large male can reach a length of 183cm (72in) with a wingspan of 3m (9.8ft) and will weigh about 17.2kg (38lb). Their closest relative is the Whooper Swan of Eurasia. The young Trumpeter Swan is grey in colour. It will turn white after its first year. Adults have white feathers and black legs and feet. They have black bills. They lay their eggs in large shallow ponds and wide slow rivers in north western and central North America. The largest breeding pairs are found in Alaska. They tend to migrate to and from the Pacific coast and part of the United States. They fly in V-shaped flocks. These birds hunt while swimming. They will dabble to reach for food in the water. They eat aquatic plants. In winter, they will also eat grasses and grains in fields. The young ones will firstly eat insects, small crustaceans as well as plants, then as they grow up they will change to become vegetarians. Their predators are Common Rave, Common Raccoon, Brown Bear and Coyote which love to eat their eggs. The Golden Eagle may even kill the adult Trumpeter Swan. The female lays about 3-12 eggs in a mound of plants on a small island, an old beaver’s house or a floating platform. The eggs are about 73mm (2.8 inches) wide, 113.5mm (4.65 inches) long and it weigh about 320 grams (11.2 oz). The incubation period is 32 to 37 days. They are very faithful to their partners – “till death to us part.” The dads are loyal to their families. He will stay with his wife throughout his whole life caring for his kids. Both mum and dad will raise their children together. Mum will keep her eggs warm until they hatch. The young ones are able to swim within 2 days and usually are able to feed themselves after 2 weeks. They will be ready to fly at 3 to 4 months old. The females will temporarily lose her flight feathers after her babies are hatched. Therefore she will not be able to fly for a month or so. The males will also go through the same process about a month later when the females are able to fly again. In this way, one flightless parent will be able to stay back to take care of the young ones. In the 19th and early 20th centuries, the poor Trumpeter Swan was hunted almost to extinction for their feathers. Their feathers make good quill pens. They are also hunted for their meat, eggs and skin. They were rare or extinct in most of the United States by the early twentieth century. Apart from that they have also been affected by the destruction of their habitat and by lead poisoning. However, their populations have since rebounded and conservation efforts have been carried out to reintroduce this birds into other parts of its original range and elsewhere. They can live up to 35 years in captivity. Their lifespan in the wild is normally about 12 to 15 years.